Vin Diesel seems to really love Facebook. Over the past few weeks the actor has used his personal page on the social networking site to post various photos of himself in character on the set of the still-untitled sequel to The Chronicles of Riddick. First we saw him wearing some kind of cape, then it was all about what appeared to be a two-bladed knife. Today Diesel has delivered a close-up. Check out the new photo below, which features the actor wearing his trademark goggles. 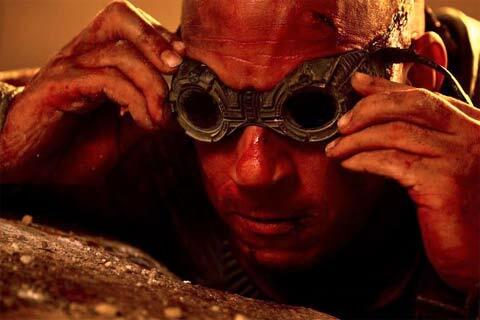 The new Riddick film is being written and directed by David Twohy, who also handled both duties on Pitch Black and The Chronicles of Riddick. The untitled movie also stars Karl Urban, Katee Sackhoff, and Jordi Mollà. The story follows Riddick as he is stranded on a desolate planet and forced to fight for survival. When bounty hunters come down to get rid of the hero once and for all, however, his greater plan for revenge is revealed and he returns to his home planet, Furya, to save it from sure destruction. It's being produced by One Race Productions and Radar Films and will be released by Universal Pictures. The film does not currently have a release date, but it's expected to come out some time in 2013. Wait, Did Vin Diesel Join The Avatar Sequels?